When the boys and I went to the cabin, I stocked up and bought a ton of pears. Albeit I got carried away, but in my defence we were going for a week and pears are a) awesome and b) not Doritos. But in true pear fashion you have a 30 second window in which these suckers go from hockey pucks to ripe to mush. Once we got home I had an enormous bag of overripe fruit that was in serious danger of becoming a fruit fly colony. Before I continue on with my pear story, I have to catch you up on what happened earlier in the summer. Sometime in June I bought a bottle of Vanilla vodka. If you've never tried it, save your money. It has no flavour. I had high hopes that adding it to coke would recreate Vanilla Coke but sadly no. 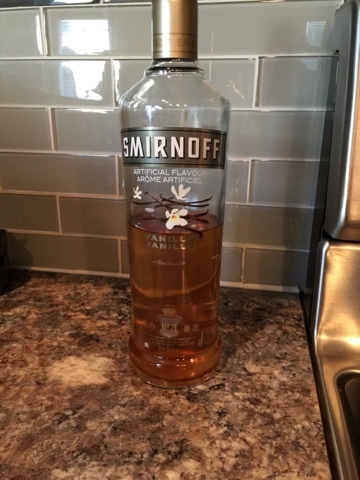 I was left with this large bottle of flavourless vodka. Where is the fun in that? Enter my bumper pear crop. I dumped the vodka into a large mason jar. I added 4 pears and a 1/2 teaspoon of cinnamon and cloves, sealed it up and waited. While that was brewing, I decided to make Salted Caramel Pear Butter. I took a huge amount of pears, 10 or so. I didn't really count. 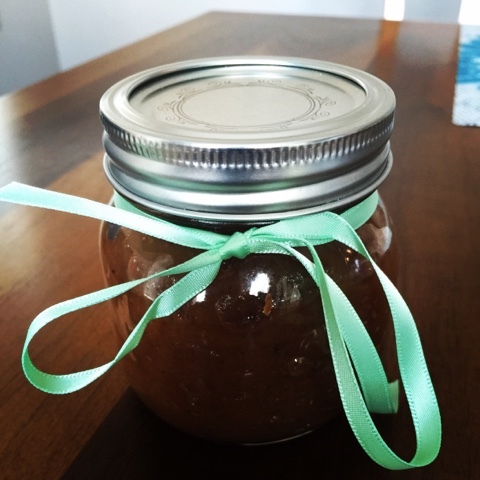 I have made apple butter before, but I didn't cook it down enough and it was more like a really thick applesauce. This time I did it right and waited for it to have the consistency of jam. I was expecting to get at least 6 mini mason jars, but the more I stirred, the less I seemed to have in the pot. End result was two tiny jars. The butter (which is basically jam) is amazing!!!! So sweet and spicy. Fast forward 5 days and I was ready to check on the vodka. I didn't take any pictures because it looked like a dogs breakfast and if I was going to serve it to my friends at some point I didn't want to document what it previously looked like. When I took the lid off, it really did smell good. Again, the pitiful vanilla scent was still missing but it had now been replaced with a spicy pear aroma. I had to filter it through cheesecloth to get all the little bits of pear, but it is now a really pretty shade of Amber. After all that, I still had a half dozen pears left. So I decided to pull out the old reliable and made an apple pear crisp. Not fancy, but everyone loves it. Sitting out in the backyard with a dish of pear crisp with ice cream was a delicious end to the day.